Is Drinking Red Wine Better than Working Out at the Gym? Can drinking red wine really compare with working out at the gym? Check out this popular belief and find out where the truth really lies...you may be surprised. Red wine contains resveratrol, which is a phytoalexin that is found in the skin of grapes. This phytoalexin is naturally produced by plants and when a plant is stressed, it creates its own antibiotic. This antibiotic is resveratrol. This substance has been studied extensively and helps prevent damage to blood vessels, helps lower low-density cholesterol and prevents blood clots. Damaged blood vessels, high levels of low-density cholesterol (which is the bad kind of cholesterol) and blood clotting all have the potential to lead to heart disease. In addition to promoting heart health, this antibiotic substance has been linked to the reduction of cells aging prematurely, the prevention of cancer cell replication and helps reduce muscle wasting that accompanies illnesses like diabetes. Consuming substances with resveratrol gives benefits that are similar to going to the gym. People who consume red wine on regular basis experience increases in muscle strength and physical performance. It also has been shown to improve the cardiovascular system, similar to the effects of a cardio work out. These improvements or enhancements, although present, are limited in scope. Another benefit of red wine is that it could help you live longer. A study that lasted 29 years found that red wine drinkers had a mortality rate that was 34 percent less than those who drank beer and vodka. 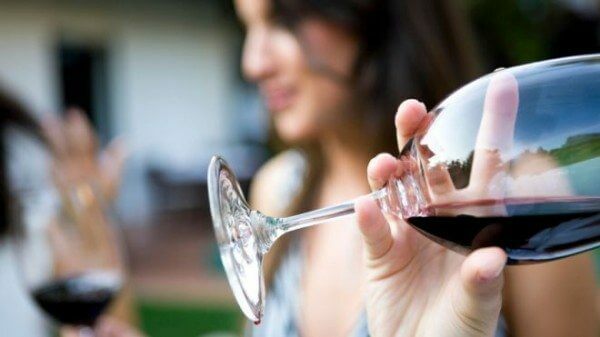 In order to get the full benefits that red wine provides, it is recommended that women consume four ounces of red wine daily and men consume eight ounces. Working out at the gym, like red wine, prevents heart diseases. Regular exercise lowers low-density cholesterol and raises high-density cholesterol. High-density cholesterol (the good kind) helps prevent cardiovascular diseases. In addition to helping regulate cholesterol, exercise lowers blood pressure, helps to improve circulation of the blood and helps strengthen the heart by making it work at maximum capacity. This strengthening of the heart muscle helps to reduce blood clots. As you know, training at the gym improves muscle strength. Improving muscle strength helps to prevent diseases like osteoporosis and arthritis. Working out helps prevent these diseases by speeding up the process of bone growth, thereby preventing your bones from becoming brittle or a loss of bone mass. All this occurs because exercise increases oxygen and blood supply to tissues surrounding the bones. Healthier tissues can better protect the bones and that leads to stronger bones. Working out also helps you increase your metabolism and control your weight. Obesity is a problem that leads to a number of ailments including diabetes and heart disease. A regular workout routine helps you to maintain your weight so you can avoid the problems associated with obesity. When you exercise, it's not only your body that gets a good work out, your brain does as well. Exercise brings an increase of blood flow throughout the body and brain and this increase in blood flow helps nerve cells in the brain that are responsible for memory. When blood flow increases these nerve cells grow and that stimulates the production of chemicals that make new brain cells. This effect on the brain indicates that exercise can help in the prevention of Alzheimer's disease. Finally, working out helps you sleep better. It’s during sleep that the body repairs itself from all the stress and damage that it undergoes during the day. The good night’s sleep that you get after working out helps you relieve stress, aches and pains and increases your level of emotional security. Both red wine and working out at the gym will help you lead a healthier life. The resveratrol in red wine is good for your heart, can help prevent cancer and even gives you a fraction of the benefits that you would receive from a cardio workout. However, going to the gym does everything that red wine does while also helping you to lose weight and sleep better. Working out at the gym is better for you, but who says you can’t work out at the gym and have your red wine too? Review: Will Citrulline Malate be the Next Big Thing in Bodybuilding?